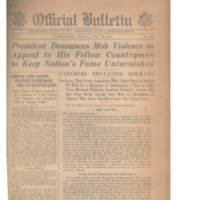 Official Bulletin with text of speech by Woodrow Wilson denouncing mob violence. Washington, Friday July 26, 1918. I take the liberty of addressing you upon a subject which so vitally affects the honor of the Nation and the very character and integrity of our institutions that I trust you will think me justified in speaking very plainly about it. I allude to the mob spirit which has recently here and there very frequently shown its head amongst us, not in any single region, but in many and widely separated parts of the country. There have been many lynchings, and every one of them has been a blow at the heart of ordered law and humane justice. No man who loves America, no man who really cares for her fame and honor and character, or who is truly loyal to her institutions, can justify mob action while the courts of justice are open and the governments of the States and the Nation are ready and able to do their duty. We are at this very moment fighting lawless passion. Germany has outlawed herself among the nations because she has disregarded the sacred obligations of law and has made lynchers of her armies. Lynchers emulate her disgraceful example. I, for my part, am anxious to see every community in America rise above that level with pride and a fixed resolution which no man or set of men can afford to despise. CLAIM TO BE CHAMPIONS OF DEMOCRACY. We proudly claim to be the champions of democracy. If we really are, in deed and in truth, let us see to it that we do not discredit our own. I say plainly that every American who takes part in the act of a mob or gives it any sort of countenance is no true son of this great Democracy, but its betrayer, and does more to discredit her by that single disloyalty to her standards of law and of right than the words of her statesmen or the sacrifices of her heroic boys in the trenches can do to make suffering peoples believe her to be their savior. How shall we commend democracy to the acceptance of other peoples, if we disgrace our own by proving that it is, after all, no protection to the weak? Every mob contributes to German lies about the United States what her most gifted liars cannot improve upon by the way of calumny. They can at least say that such things cannot happen in Germany except in times of revolution when law is swept away! I therefore very earnestly and solemnly beg that the governors of all the States, the law officers of every community, and, above all, the men and women of every community in the United States, all who revere America and wish to keep her name without stain or reproach, will cooperate -- not passively merely, but actively and watchfully -- to make an end of this disgraceful evil. It cannot live where the community does not countenance it. I have called upon the Nation to put its great energy into this war and it has responded -- responded with a spirit and a genius for action that has thrilled the world. I now call upon it, upon its men and women everywhere, to see to it that its laws are kept inviolate, its fame untarnished. Let us show our utter contempt for the things that have made this war hideous among the wars of history by showing how those who love liberty and right and justice and are willing to lay down their lives for them upon foreign fields stand ready also to illustrate to all mankind their loyalty to the things at home which they wish to see established everywhere as a blessing and protection to the peoples who have never known the privileges of liberty and self-government. I can never accept any man as a champion of liberty either for ourselves or for the world who does not reverence and obey the laws of our own beloved land, whose laws we ourselves have made. He has adopted the standards of the enemies of his country, whom he affects to despise. Wilson, Woodrow, “President Denounces Mob Violence in Appeal to His Fellow Countrymen to Keep Nation's Fame Untarnished,” 1918 July 26, TI00144, Race and Segregation Collection, Woodrow Wilson Presidential Library & Museum, Staunton, Virginia.